HYDERABAD, India – Namdhari AV is one of India’s leading audio/video rental companies, having provided sound, lighting, staging, exhibit design and other services for a number of the country’s biggest events and concerts since 1982. Continuing their commitment to providing clients with nothing less than the very best, Namdhari AV became one of the first companies in India to purchase a complete HARMAN Professional JBL VTX Series line array system, along with Crown I-Tech HD Series amplifiers. Namdhari AV recently made the decision to upgrade its rental and tour sound inventory and has already had great success with JBL VERTEC® line arrays and Crown I-Tech HD amps at events like the Bharatiya General Party campaign for the 2014 Indian general election and many others. 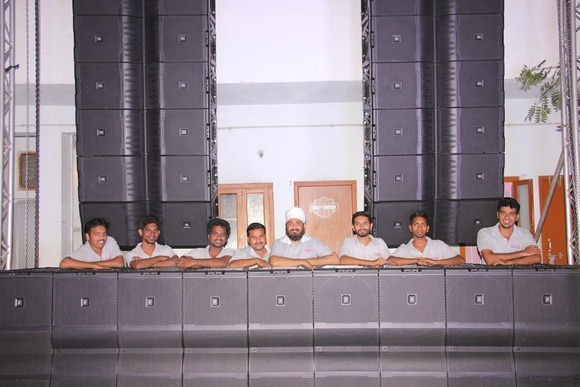 “It was only logical to make the move to a JBL VTX and Crown system after considering all options and brands,” said Gurmukh Singh, owner of Namdhari AV. Namdhari AV purchased 18 JBL VTX V25 fullsize line array elements, 12 S28 subwoofers and six G28 ground-stackable subwoofers, along with accessory kits for transporting and covering the speakers. The company also added Crown I-Tech 12000HD Series amplifiers to power the loudspeakers and subs. “A big part of the extraordinary performance we’re getting from VTX is the implementation of the V5 presets on Crown I-Tech HD amps that optimize V25 performance,” Singh pointed out. The VTX V25 is a true 3-way system design featuring JBL’s proprietary D2 Dual Diaphragm Dual Voice Coil compression driver, which delivers dramatically increased high-frequency sound pressure levels and power handling with greatly reduced distortion. The V25 employs two 2267H 15-inch Differential Drive woofers, four 2169H 8-inch ultra-linear midrange transducers and three 2430K D2 dual drivers. Its Radiation Boundary Integrator (RBI) waveguide provides a more seamless transition between the high-frequency and midrange drivers and its S.A.F.E. suspension system provides improved hardware that enables faster and more secure rigging. Namdhari AV has wasted no time putting its new VTX system to the test at high-profile events like the 2014 Navratri festival in honor of Goddess Durga, which drew more than 20,000 attendees, and the HUM HAIN Umeed-e-Kashmir benefit concert.